I've been having a lovely time stumbling around the internet finding all kinds of interesting things. When I first learned about StumbleUpon, I checked it out and downloaded the tool bar and I started stumbling through my areas of interest. 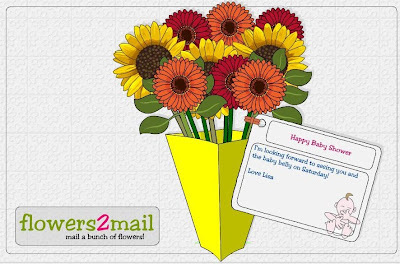 This is one of the first sites I stumbled upon: Flowers2Send....Just cute, cute, cute...and I sent off a bouquet to my BFF Val who will be having a baby shower here at the ranchero on Saturday. Check it out and start creating and sending your masterpieces to your friends and loved ones. I didn't know Val was pg already!! That's so wonderful! Give her our congratulations won't you?